Innu people and their ancestors lived in the Quebec-Labrador peninsula for thousands of years before Europeans arrived at North America in the late 15th and early 16th centuries. Like other precontact Aboriginal groups, the Innu's forebears were a self-sustaining people who had extensive knowledge of their natural environment and exploited a wide range of resources to survive. All of their food, clothing, shelter, tools, weapons, medicine, and other goods came from the world around them. Animals, for example, provided food and clothing, while timber provided shelter and fuel. Although our understanding of precontact Innu groups is incomplete, archaeological evidence suggests they were a nomadic people who employed a seasonal round of activities to harvest different resources as they became available. They likely spent the colder months hunting caribou inland before visiting coastal areas in the spring and summer to catch seals, fish, and other marine animals. Some archaeologists believe the Innu's immediate ancestors, known as the Point Revenge people, reduced their use of the Labrador coast after the Thule, whose descendents are the Inuit, arrived in the region between about 1250 AD and 1450 AD. The Thule depended heavily on marine resources and competition with them may have prompted the Point Revenge people to spend more time in interior regions of the Quebec-Labrador peninsula. The earliest human beings to inhabit North America are known as Palaeo-Indians. Although it is not known precisely when they first arrived at North America, archaeologists believe they crossed the Bering Strait about 12,000 years ago and migrated from Siberia to Alaska. From there, Palaeo-Indians gradually spread across the continent and arrived at the Quebec-Labrador peninsula about 9,000 years ago, after the glaciers that previously covered the region had melted. As the centuries passed, the descendants of these first settlers developed into a new culture known as the Maritime Archaic people; some archaeologists suspect these people were distant ancestors of the present-day Innu, although no evidence currently exists to prove this theory. The Maritime Archaic people lived along the Labrador coast from about 7500 to 3500 BP (before present), where they harvested a broad range of marine resources, including seals, walrus, fish, and seabirds. Some archaeologists suspect the Maritime Archaic people were distant ancestors of the present-day Innu, although no evidence currently exists to prove this theory. From J. A. Tuck. “Prehistoric Archaeology in Atlantic Canada Since 1975.” Canadian Journal of Archaeology No.6 (1982), p 203. Illustration by Tina Riche. The Maritime Archaic people also hunted caribou and other land mammals for meat as well as for skin, bones, and antlers, which they manufactured into clothing, tools, and other items. Like those of most Labrador precontact cultures, the Maritime Archaic people fashioned projectile points and other tools from Ramah chert and a variety of other stones indigenous to the region. The group disappeared from the archaeological record about 3,500 years ago for reasons currently unknown to researchers. A variety of other pre-contact cultures occupied Labrador in the centuries after the Maritime Archaic people disappeared. Among these were the Recent Indians, a group which archaeologists have subdivided based on time into the earlier Daniel Rattle people, who inhabited Labrador from about 2000 BP to 1000 BP, and the later Point Revenge people, who inhabited Labrador from about 1000 BP to 400 BP. These groups were named after the locations where archaeologists first found artifacts connected to them. The Daniel Rattle and Point Revenge peoples are thought to be essentially the same cultural group, however, their technology changed through time to the point where archaeologist have given the two groups different names. The Daniel Rattle people made broad projectile points that were notched in the sides, while the Point Revenge people made much more narrow points that were notched in the corners. Similarly, the large square-based bifaces used by the Daniel Rattle people gave way to the smaller triangular bifaces used by the Point Revenge people. 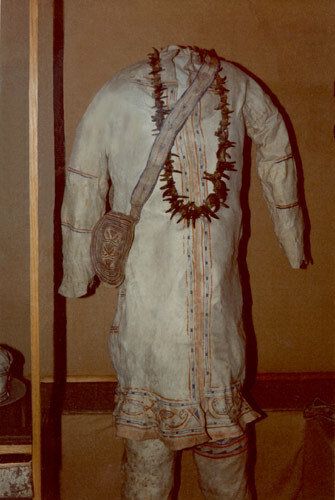 Many archaeologists have argued that the Point Revenge people are the immediate ancestors of the present-day Innu, although concrete evidence has yet to be found. The Point Revenge people were hunter-gatherers. They had extensive knowledge of their environment and understood when different resources became available and where to harvest them. They knew, for example, when caribou and seal migrations occurred, which berries and herbs were edible, when they were in season, and where productive fishing grounds were. It was this familiarity with the natural world that allowed the Point Revenge people to survive in the subarctic and unforgiving Labrador environment. Like the Maritime Archaic people, Point Revenge groups likely moved from one region of their territory to another to harvest different resources as they became available at different times of the year. Archaeologists believe they spent the fall and winter hunting caribou and other land mammals inland before moving to the coast in the spring and summer to catch fish, seals, and other marine animals. By harvesting a wide range of resources instead of specializing in one or two activities, the Point Revenge people were better equipped to withstand years when the caribou hunt failed or when seal and other prey populations were low. The Point Revenge people demonstrated great resourcefulness in their use of natural resources. Animals were not only a source of food, but also provided skins for clothing and shelter, as well as bones, teeth, and antlers for weapons, tools, ornaments and other objects. Caribou were particularly important because they yielded large amounts of meat and their hides could be put to a variety of uses. Archaeologists believe women made coats, pants, hoods, moccasins, and leggings from caribou hides and that the material also served as a covering for tents. Precontact Innu women used caribou hide to make coats, pants, hoods, moccasins, leggings, and other clothing. Hides also served as a covering for tents. Photo by Tina Riche, ©1997. Modified by Lisa Ledrew, 1999. Plant life served a variety of purposes in Point Revenge society. Trees provided wood for the construction of shelters, weapons, bowls, and other implements, as well as fuel for fire, while evergreen boughs likely served as bedding. Birch bark was an important resource that allowed for the manufacture of canoes and containers, and could be used as a covering for tents. The Point Revenge people likely exploited some tree and plant species for their medicinal qualities – boiled cherry-tree bark may have been a precontact cough medicine, and crushed buttercup leaves a remedy for headaches. Although animal protein accounted for most of the Point Revenge diet, individuals also consumed edible fruits and greens. These likely included blueberries, raspberries, pin cherries, and elderberries, as well as dandelion leaves, Labrador tea, and other local herbs and greens. Stones were of tremendous importance to Point Revenge society and served as wood-working tools, pointed hunting blades, symbolic ornamentation, and various other utensils. A stone known as Ramah chert was particularly useful for the manufacture of cutting and hunting implements because it was brittle and could be broken into sharp-edged flakes with relative ease. Many of Labrador's precontact peoples made use of this stone. Another precontact group of hunter-gatherers was active along the Labrador coast by the 15th century. Known as the Thule, these people were the immediate ancestors of the Labrador Inuit and relied heavily on marine resources for survival. 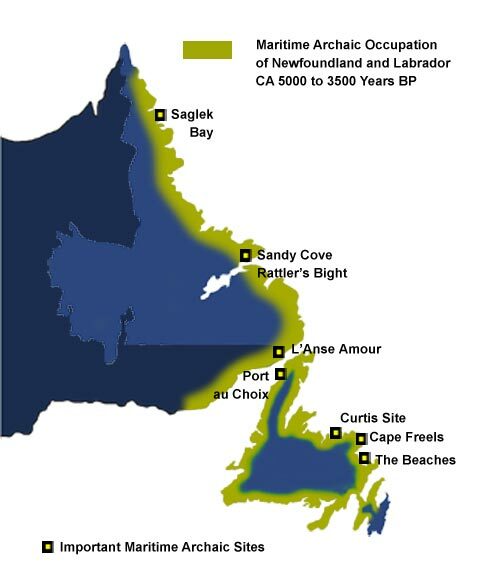 Archaeologists believe competition for coastal resources with the Thule may have prompted the Point Revenge people to spend increasing amounts of time in interior regions of the Labrador-Quebec interior, where they hunted caribou and exploited marine resources in deeper bays and river mouths, as well as along Quebec's north shore. By the time European missionaries became active in Labrador during the 18th century, the Innu displayed a culture that was more oriented toward the interior than their precontact ancestors. Although the Innu specialized in caribou hunting to a greater extent than the Point Revenge people, the groups had much in common. Like their forebears, the Innu were a nomadic self-sufficient people who employed a seasonal round of activities to survive – hunting in the colder months and harvesting marine resources in the warmer seasons. They were skilled at making clothing from caribou hide, canoes from birch bark, and weapons and utensils from stone and wood. They had an intimate knowledge of the Quebec-Labrador interior and were well-adapted to their environment, traveling by birch bark canoe in the summer and by snowshoe and toboggan in winter. Like other Aboriginal groups in Newfoundland and Labrador, everything the Innu ate, wore, built, and used at the time of European contact came from their immediate surroundings. The term prehistoric, in this article, updated to precontact October, 2016.